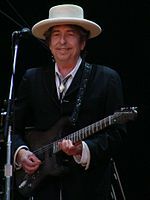 Dylan's lyrics have incorporated a variety of political social philosophical biblical and literary influences. Much of Guthrie's repertoire was actually channeled through Elliott and Dylan paid tribute to Elliott in Chronicles (2004). They defied existing pop music conventions and appealed hugely to the then burgeoning counterculture. Initially inspired by the performance style of Little Richard and the songwriting of Woody GuthrieRobert Johnson and Hank Williams Dylan has both amplified and personalized musical genres. Much of his most celebrated work dates from the 1960s when he was an informal chronicler and a seemingly reluctant figurehead of social unrest. Bob Dylan (pron.